Residential Waste Provides Trash and Recycling Pick up for the Town of Trumbull and Trash pick up for the Town of Monroe. Customers are given a 96 gallon garbage can to use at no additional cost. The can is on wheels and equivalent to 3 of your average household garbage cans. Our 96 Gallon cart is animal resistant and can withstand winds up to 35 mph when empty. Please call us at 203-334-1660 if you need an additional can. 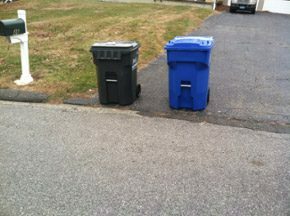 Residential Waste Offers both Curbside and Driveway Service. Driveway service can be used by any customer but is most common for customers with long driveways. If you have curbside pickup, please place your can facing the street, and make sure it is 3 feet away from the recycling cart, telephone poles, mailboxes, cars, or additional cans for those who have them. An example is pictured below. Please put trash and recycling out the night before your pick up day! Our Yard Service program was created to make trash removal easier for homeowners. The goal of our Yard Service program is to make trash removal as easy as possible. You don’t have to worry about taking your trash to the curb or when it’s time for us to pick it up. Our small truck travels up your driveaway and one of our team members will empty your trash bin and put it back in place. We do all the work!